Author Data: Of course you will want to let your publisher and your readers know that this work belongs to you. 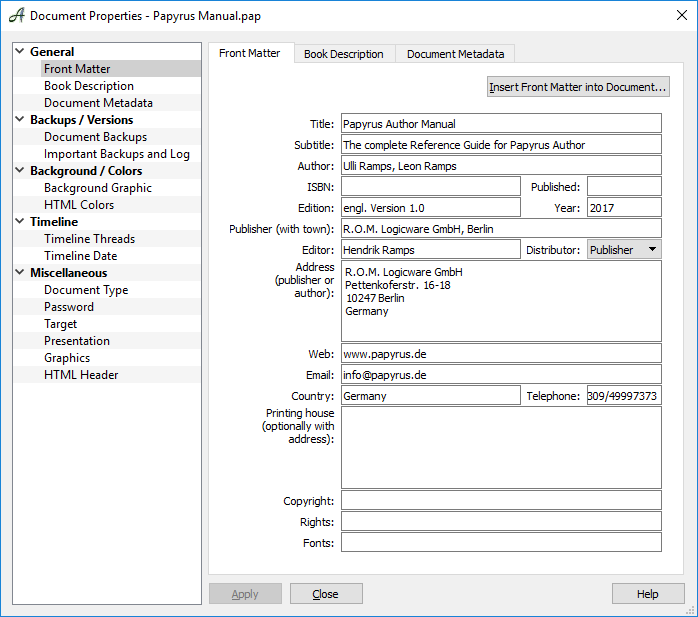 Papyrus makes this step easy by allowing you to enter your information once and then add author data automatically to your documents for the front matter, title pages, etc. The “Author Data” dialog (“Preferences” → “Documents”) allows you to enter your personal data globally for all your documents. Papyrus will take the information from your computer as a preset. This personal data will be used for new documents, but can also be entered in “Document Properties” (menu “Document”) under → “Front Matter”) for the current document. This data can be saved as placeholders in your templates, so that you don’t accidentally forget something, make a mistake or enter a typo that goes unnoticed. The placeholders can be entered in the Reference dialog (“Insert” → “Reference”). Under “Reference to” choose “Choice of Words,” enter the placeholder and select the “Add” button. 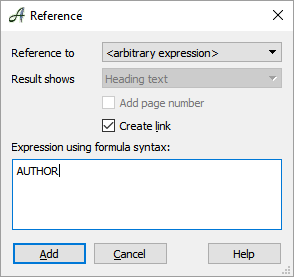 You can enter the author’s name as well as other important data for you text.